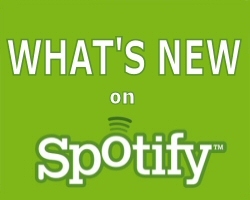 Here’s a temporary solution to the problem of Spotify’s lack of new-release updates. Following my post about it last week (and the related support thread), reader Steve (digithed) suggested reading Spotify’s metadata API with a query on albums tagged as new. Coding wizard Andy Smith (of spotibot fame) then stepped in to help implement the XML output as a webpage: the result is this auto-generated list of new releases! There are a few caveats though and this is merely a stop-gap solution. Read on for more detail. Albums (including singles and EPs) are listed alphabetically by artist with clickable links to open the album (or artist page) directly in Spotify. The list also tells you in which country the album is available: the UK, Sweden, France, Spain, Norway, or Finland. Unfortunately though this isn’t a perfect solution. Limitations of tag:new means that the list is somewhat random and there’s a maximum of 1,000 albums listed regardless of how many new releases there are. 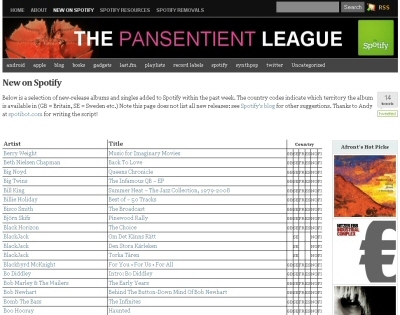 The list is generated whenever Spotify add new music and build their new search index. It includes albums and singles with a release date in the past week. A consequence of this is that back-catalogue albums newly added to Spotify will not show up, so you might need to continue to manually check whether any older favourites have been added lately. Often multiple versions of an album might be released: the UK version, the Swedish version, the UK Special Edition version etc. The What’s New list might include some or all of these. If you get the “Not in My Country” message, try clicking the artist name instead: more often that not, the album you want will be there as a different version. Hopefully Spotify will be adding a “date added” field to their metadata soon. This would be the perfect solution and is eagerly anticipated by the Spotify community.